Maurits Cornelis Escher, usually referred to as M.C. 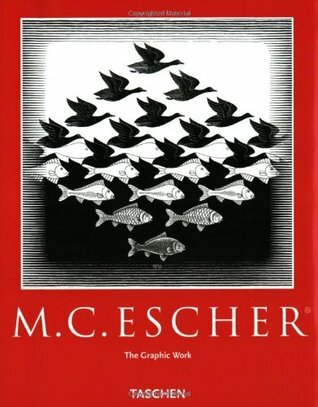 Escher, was a Dutch graphic artist. He is known for his often mathematically inspired woodcuts, lithographs and mezzotints. These feature impossible constructions, explorations of infinity, architecture and tessellations. Maurits Cornelis, or "Mauk" as he came to be nicknamed, was was the youngest son of civil engineer George Arnold Escher and his second wife, Sara Gleichman. He was a sickly child, and was placed in a special school at the age of seven and failed the second grade. In 1903, the family moved to Arnhem where he took carpentry and piano lessons until he was thirteen years old. In 1922, an important year in his life, Escher traveled through Italy (Florence, San Gimignano, Volterra, Siena) and Spain (Madrid, Toledo, Granada). He was impressed by the Italian countryside and by the Alhambra, a fourteenth-century Moorish castle in Granada, Spain. He came back to Italy regularly in the following years. In Italy he met Jetta Umiker, whom he married in 1924. The young couple settled down in Rome and stayed there until 1935, when the political climate under Mussolini became unbearable. Their son, Giorgio Arnaldo Escher, named after his grandfather, was born in Rome. The family next moved to Chteau-d'x, Switzerland where they remained for two years. Escher, who had been very fond of and inspired by the landscapes in Italy, was decidedly unhappy in Switzerland, so in 1937, the family moved again, to Ukkel, a small town near Brussels, Belgium. World War II forced them to move in January 1941, this time to Baarn, the Netherlands, where Escher lived until 1970. Most of Escher's better-known pictures date from this period. The sometimes cloudy, cold, wet of the Netherlands allowed him to focus intently on his works, and only during 1962, when he underwent surgery, was there a time when no new images were created. Escher moved to the Rosa-Spier house in Laren in 1970, a retirement home for artists where he had his own studio. He died at the home at 73 years of age.